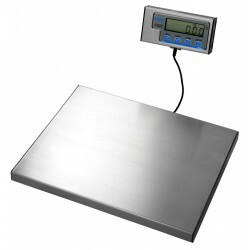 With 1 part in 6000 resolution the Salter WS300 platform scales give a weighing performance of 300kg x 50g. These well designed low profile machines incorporate four full load bridge loadcells with self leveling, anti-slip feet to give a solid base in use. The generous size weigh platforms is available in a choice of 550 mm x 550 mm or 900 mm x 550 mm (supplied as standard with a green rubber mat). WS 300 Platform Scales have a tough, mild steel understructure and a stainless steel top. 5 metres of cable connects the base to the stainless steel indicator pod which features clear 17 mm high LCD display digits. A plastic display pod bracket is included to enable the indicator to be wall or bench mounted. Key display features are: on/off, push button tare to enable container weights to be removed and net weight only displayed; kg/lb switching to give readings in either metric or imperial measures and hold/print, which allows the weight to be either frozen even when the item being weighed is removed or the weight to be transmitted to a printer or other peripheral device. The WS300 scales feature auto zero tracking to automatically compensate for small fluctuations in zero such as a build up of material on the platform. To extend battery life an auto-off feature is standard, with the WS300 scale switching itself off after 2 minutes of inactivity.